The screen shots below are screen shots of the highlighted are in red in image to the right. This shows security information by role. It allows filtering of users/groups. This is useful for comparing security information by user/group. In the example below in the grid you can now easily compare the roles for the 2 users ian-xps\ian and ian-xps\fred. Filtering of users and groups is useful when you are looking for security for specific users and groups. In the above example you can now compare the roles for users Ian and Fred and quickly see the role differences. In this tab the security for a selected user/group is displayed. 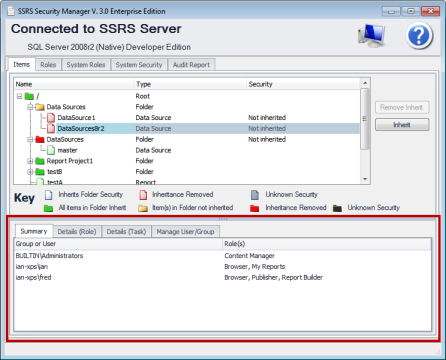 Additionally there is a task/role summary column showing the summation of task security for the roles assigned to the user.